The Brunswick Inn is one of those feted pubs whose reputation reaches far beyond the boundaries of its own city. I’ve been wanting to come here for ages, and today seems the right time. Why? I’ve given myself the day off work to potter around on a Derbyshire Wayfarer: a miraculous ticket that gets you all over the county and beyond by public transport, all day, for eight pounds something. So in the afternoon I squeeze onto an alarmingly but routinely overcrowded Crosscountry train and alight at Derby. Then, after ten minutes getting the feeling back in my limbs, I stroll past the picturesque former railway workers’ cottages outside the station, and down to the Brunswick. And what a fine place it is, with four separate rooms, whacking great flagstone floors, windows in the walls, plenty of light and dozens of interesting old pictures and mirrors across the walls. There’s a garden and a smoking shelter, for those of you who do. The décor is handsome but slightly austere, impressive rather than relaxing. Half a dozen beers are on tap from the in-house brewery (starting at less than two quid a pint for the White Feather) and about as many again are present as guest ales. There’s an interesting-looking menu persuading me to come back for lunch sometime. My meat-free diet means I’ll have to pass on the goat korma, but at £3.50 for mushroom stroganoff it would be rude not to. There’s also a funny little white dog with black speckles, walking up and down along the pub, but I can’t guarantee that he or she will be here again should you choose to pay a visit of your own. The two large rooms are both very busy for three o’clock on a weekday afternoon. I grab a smoky half of Railway Porter and sit in one of them to listen to the people. There’s a dartboard, a fruit machine and nine men talking. Just in front of me, two middle-aged chaps are talking about the government’s cuts to public services. “They’re basically condemning people to death,” says one, and they don’t look the sort to be making condemn/Con-Dem puns. To my side are a group of thirsty railwaymen, surrounding a large platter of sandwiches seemingly laid on by the pub in an official function sort of way. They’re all talking shop. Very loudly. Despite the sardine-like experience of travelling here, I still love trains as much as I love pubs, so I sit and eavesdrop for a bit. But part of my purpose today is to spend some time on the bunch of half-finished song lyrics I’ve got kicking around. And I fail completely to get any more writing done here because it’s way too loud to concentrate. So I find a quiet spot in the next room where I can just fail completely to get any more writing done because the beer’s too nice. Presently, men in ones and twos filter through to this smaller room, while I gulp a pleasing pint of Second Brew. Some nod acknowledgment to me: a friendly gesture given how much of an outsider figure I must cut, clearly not here after work, younger than nearly everyone, sitting in the corner with only pens, paper and a netbook for company. I want to come back when I can concentrate on people instead of writing, and I will come back because this is an excellent pub which will only get better as the evening rolls on. If it’s this loud and atmospheric and alive on a Friday afternoon, what’ll it be like in five hours’ time? For as long as pubs have existed, people have always gathered in them to recover from work. Or to complain about work. Or sometimes even to do work. And when there’s been no work, people have gathered in pubs for something else to do. The folks behind the Brunswick have grafted hard to create a great place where local people (or at least local men) enjoy doing all of these things. And as far as I can see, it’ll all carry on for a while yet. Poet and musician. Sheffield. Maps, coastlines, walking, whisky, and potentially dangerous levels of wist. Grimbarian. Pedestrian. King of the impossible. Big girl's blouse. No mention of the fine Alexandra practically next door? I guess I’ll just have to go again. I really liked the Brunswick when I went there on Indietracks Monday (on Moopind’s here suggestion). It’d just gone 11am so it was deserted and didn’t feel blokey. 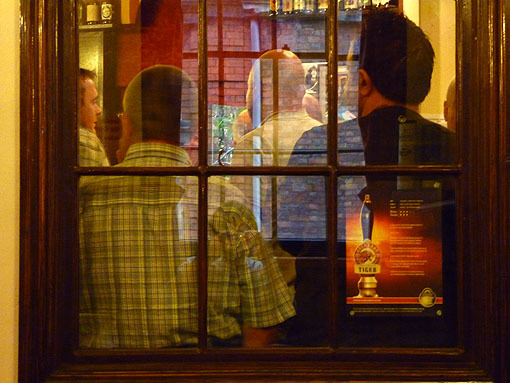 But I always hate finding myself in a pub full of men – not because I’m intimidated but because it reminds me that even our free time is plagued by gender segregation. I’d love to go back to the Brunswick when it’s busier though. Trains! Re the Alexandra. Unfortunately it is now closed most days. The Brunswick is also a fine place to go to on match days. 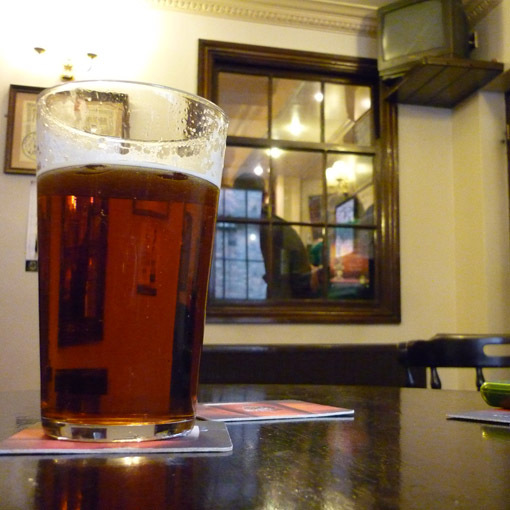 Away supporters are welcome al long as they are of the appreciating the real ale variety. The place is friendly- there are more women going there in the evenings and weekends. I’ll come to the Alexandra. I can put you off your work. It’s even got a girl’s name. Another great post Pete! The Bruny remains a great pub despite the departure of its saviour, local brewing deity Trevor Harris, who now heads the Derby Brewing Company. Next time you are in town can I recommend Trevors new ventures The Brewery Tap (aka Royal Standard) and The Greyhound (see my blog post for opening night impressions http://whitemore.wordpress.com/2010/05/22/there%e2%80%99s-life-in-the-old-dog-yet/). 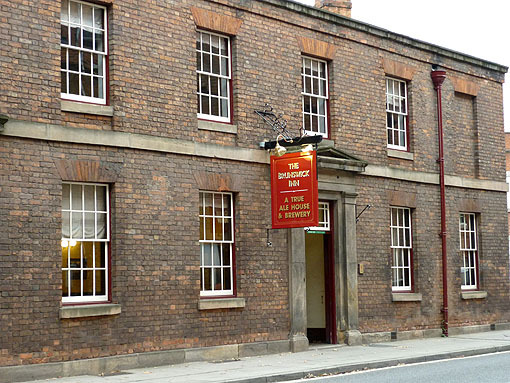 That said there are loads of wonderful real ale pubs & microbreweries in & around Derby so drop me a line if you are in the area and want any hints. I will certainly be keeping an eye on your reviews for drinking inspiration on my travels! Thanks a lot, Tim – I’ll make sure to take your advice next time I get to the pub in Derby. And thanks everyone for all the comments! Am due at the Brunwick on Monday for a meeting of the Retired Members section of the CWU union and will post further comments then.